Gospel story sacks is a resource for family devotions. I am mostly using "The Jesus Storybook Bible" with my children. 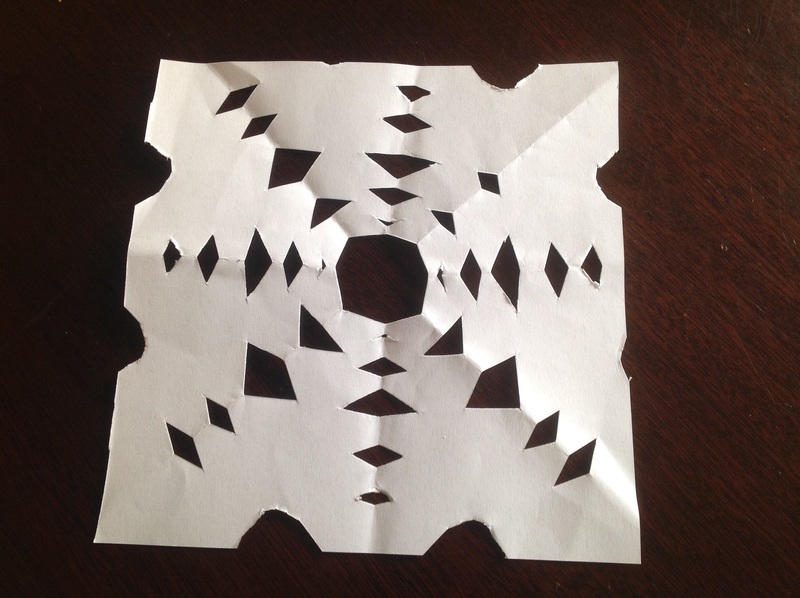 On the blog there are activities and object lessons to help reinforce the gospel message. You will also find Bible lessons for young people which we have used at our church. Remember who the real enemy is! Cross your fingers, it’s Friday the 13th! What’s your fruit of happiness? Finding the gospel in Frozen – Bible lessons from the disney film Frozen. This is a 6 week series that I did with the scripture Union group in school aged 9-11 years old. “The heart is not so easily changed but the head can be persuaded. Your power will only grow, there is beauty in it but also great danger. You must learn to control it. Fear will be your enemy”. It’s important to remember that Elsa’s powers themselves were not bad but could be used for good. God has made each and every one of us with special gifts, talents and abilities. We are created in the image of God who is wonderfully creative, loving and kind. However, He also hates sin because He knows it will lead to us hurting each other and ourselves and worse still it separates us from Him. Q1. What is stopping Elsa from living her life outside of the castle or being closer with her sister Anna? – Fear/Being Scared of hurting someone, especially someone she cares about. Q4. How can fear stop us from enjoying life? – Being scared to try something new, not letting people get to know you. Just like in the film Frozen the Bible warns against fear. BUT unlike the film God doesn’t expect us to overcome our fears alone. David talks about God being “The good shepherd” who looks after his sheep, cares for them, provides for them, protects them and guides them. God does the same for us. 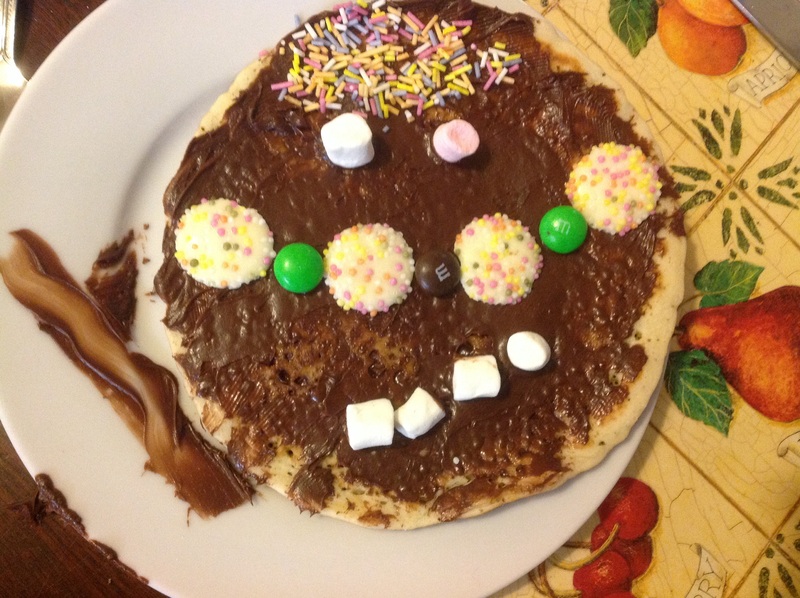 Arts and crafts– make troll pancakes – decorate with chocolate icing, marshmallows, sweets and sprinkles. 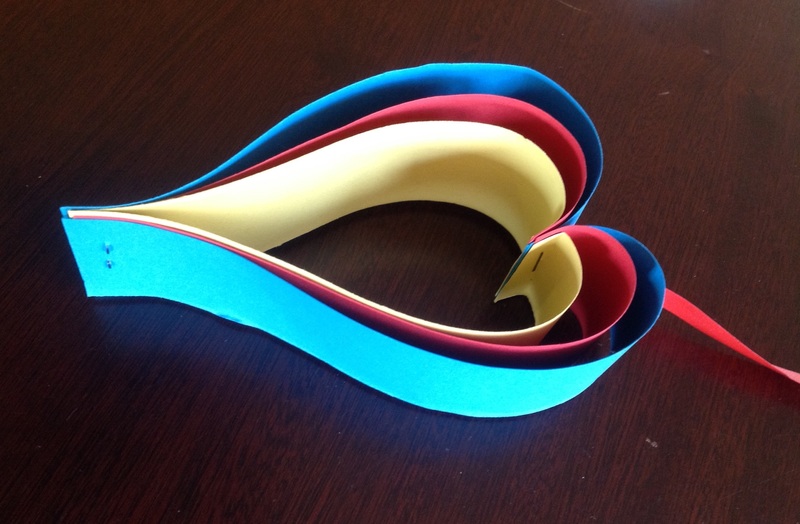 Week 2 Selfish v giving love – what is real love? Q: What is true love? One of the lines that Anna sings is “Say goodbye to pain of the past”. People will always let us down or hurt us. Just like Anna put all her hope and trust in Hans we can sometimes look to a person to fill a God shaped hole in our hearts. When we let God be at the centre of our hearts and be our true love THEN He can help us to beome more like Jesus. It’s only then that we can really have true unselfish love in our hearts. Hans didn’t turn out to be a very good “true love” and even tried to kill Anna and her sister. Both Hans and Anna’s idea of true love was not right. She thought he would solve all her problems and heal her hurts and Hans just wanted a kingdom for himself. Both of their attitudes were about “me and what I can get”. But Gods idea of true love is all about the other person and what you can give. We know that God is LOVE because he loves us so much that He sent His Son to die for us so that we could be free to love Him and others. There are lots of stories of soldiers who threw themselves on hand grenades to save their fellow soldiers lives but didn‘t live to tell about it. Those whom they saved retell this most selfless act. This in itself is amazing but Jesus lay down His life for people who hated Him and hurt Him. He offers forgiveness for everyone as a free gift. We found out last week what it meant to have a “one true love” and that Jesus is our only True love who will never let us down. This week we are going to listen and watch Elsa sing the song “Let it go” and look at another type of Disney saying to be “true to yourself” and see if this is always a good idea. While there is truth in the fact God made us perfectly and we should be ourselves, the Bible also says we are to put others needs before our own and NOT always think of ourselves first. In the film when Elsa is eventually “true to herself” and “lets it all go” she wreaks havoc on the world and leaves shattered relationships in her wake. The fallout from her actions is devastating. “No right, no wrong, no rules for me” is the sin that isolates the princess and freezes her kingdom. She is still trapped by fear. Q: Does fear come from God? – No, Love comes from God. There is no fear in God. It’s only after sacrificial love saves her from the effects of the curse that the princess is free to redirect her passion and power – not in “turning away” and “slamming the door” and expressing herself – but in channelling her powers for the good of her people. If there is a moral to Frozen, it’s that “letting it go” is self-centred and damaging. We need our special gifts and talents to be shaped by Jesus, to live our lives as a sacrifice for Him, no longer living for ourselves but living for Jesus. Q: If you could wish for anything what would it be? Sometimes the things we wish for are good things but sometimes they are not good for us. God has the best plan for our lives and we can find out what that is when we walk with him and talk with him and learn more about him every day. Take this light (show them a torch with batteries taken out). This is like our lives before we become Christians but look what happens when we let Jesus be in charge of our lives and live in us and with us every day (put batteries in). Gods Holy Spirit comes and lives in us. Being a Christian is not about being good enough or trying really hard it is about having a relationship with Jesus and allowing Him to take charge of our lives. Just like it says in the Bible verse we read, God makes us strong when we let Jesus “make His home in our hearts and we trust Him.” This He offers as a free gift. Olaf wanted to experience summer but didn’t realise he would melt. He ended up being a hero and helping to save Anna and also was gifted with his own personal flurry. Just like Olaf needed a miracle to stay alive, in real life when we trust in God He achieves in us more than we can ever imagine. BUT not always as we expect. 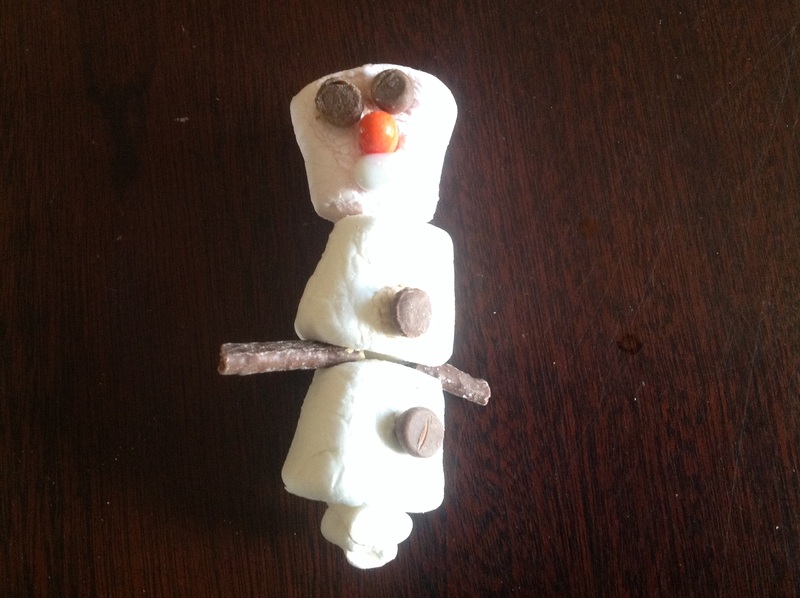 Arts and crafts – marshmallow Olaf – used cocktail sticks, marshmallows, tic-tacs,matchmakers and chocolate drops to make Olaf. Week 5. Are we perfect or are we all fixer uppers? Watch the clip of song Fixer Upper. “For everyone has sinned; we all fall short of God’s glorious standard”. No matter how hard we try we can never be as good as God. Imagine that the hole in the centre of this cardboard is Gods standards of goodness and each time I do something good and unselfish I make it through the hole (I had cut hole in cardboard box big enough to fit a paper plane). Just like the paper planes we sometimes hit the mark and do right but most of the time we miss the mark and we sin by thinking of ourselves first and being selfish. Sometimes we need to know the bad news so that we can really appreciate the good news. Lets look at what the good news is! Jesus is the only one who did everything right and for the right reasons. He is the only person ever to live that didn’t need to be fixed up as He lived a perfect life. Why did he live the perfect life? So that he could die the perfect death and pay the price for our sins and mistakes so we can once again be close to God as a lovingly heavenly Father. Jesus show us true love by dying on the cross for us. He is able to heal our hearts and help all of us who are fixer uppers. 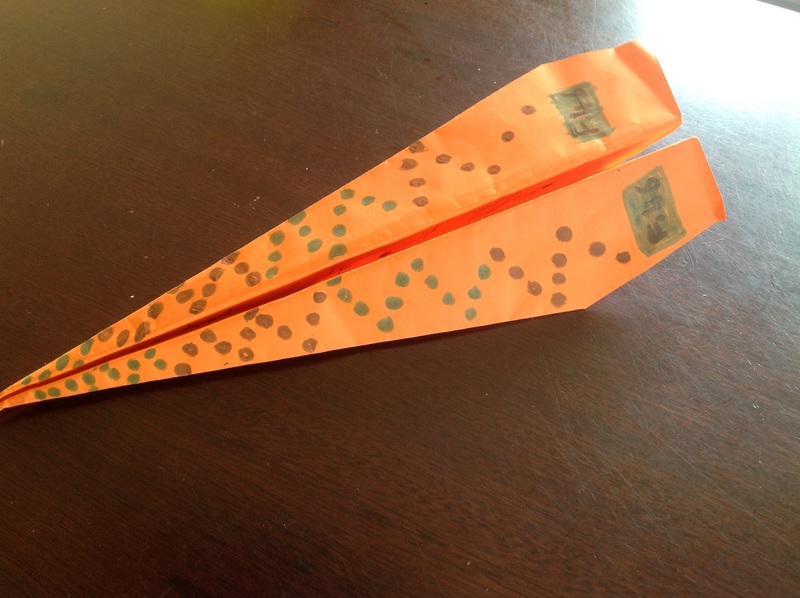 Arts and Crafts – Make and decorate paper aeroplanes and have some target practice. Week 6. Love can thaw a frozen heart. Anna has the opportunity to live but sacrifices herself because of the love she has for her sister. This love was strong enough to melt a frozen heart. Q: Do you believe that love is more than just a feeling? We can sometimes get caught up in our feeling and if something feels right it must be right but true love is expressed in self-sacrifice, putting other people’s needs before our own. The main example of this in all of history was Jesus’ willingness to give His life for the world. The only way to change and really experience joy, peace and true happiness in life is through looking at Jesus not looking to ourselves. At the end of the movie, Anna sacrificed herself to save her sister Elsa (an act of true love itself). Q: How did Jesus show us true love? – He chose to die for us, when he didn’t have to so that we could have life, real life. And that starts as soon as we become Christians. We don’t follow Jesus just to get to heaven but because He gives us a new life right now and the more we get to know Him the more like Him we become. Q: Do you ever feel like nobody cares? *We are precious children of God, *loved by Him, *made for a purpose and He also promises us that *He will always be with us and never leave us. Q: How was Elsa able to gain control of her powers and unfreeze Arendelle? – Through the power of love. 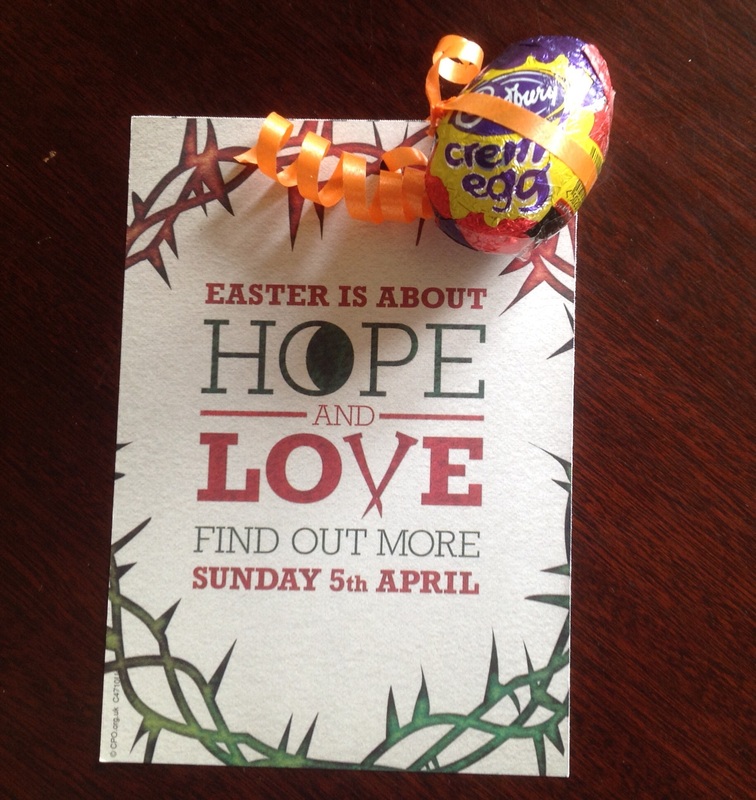 Have an Easter egg hunt – We hid some eggs around the garden with a leaflet attached explaining the true meaning of Easter.